"It is just three months ago that Blue came to live with us. It feels like she was here for always." 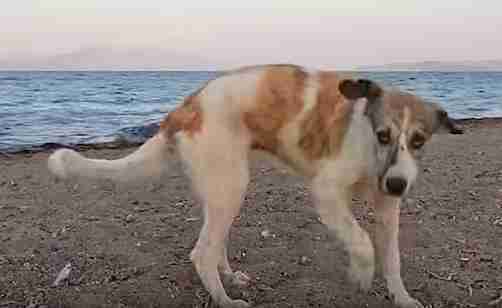 Last August, a woman from Athens, Greece, was vacationing in a small tourist town by the sea, walking her dogs on the beach the way she always does, when she spotted a stray dog. 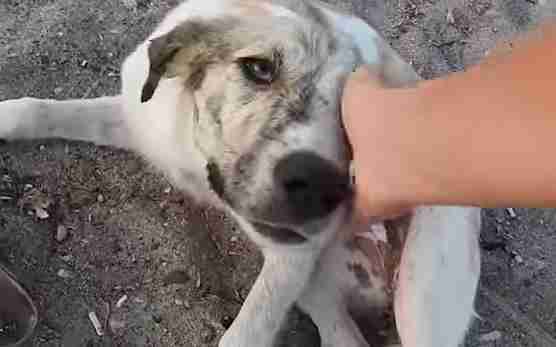 Valia Orfanidou, an animal lover, is used to seeing stray animals. There are many stray dogs and cats on the islands. "When you are an animal lover living in Greece, you simply get used to lonely stray dogs wandering around everywhere," she said, "and choose to rescue the ones that can't make it on the streets: the sick, emaciated or hurt ones, the newborns and the pregnant females." But something about this particular dog - who appeared to be pretty young and didn't appear to have any of those pressing needs - made Orfanidou feel a deep sense of urgency. "I panicked," Orfanidou said. "There was something about her that made her life as a stray extremely vulnerable." 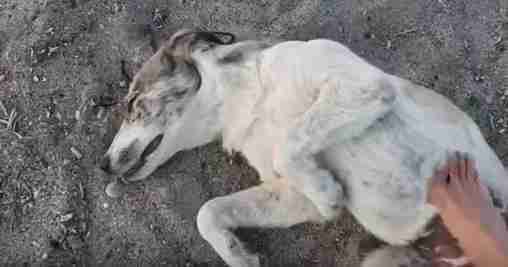 The stray dog rolled over onto her back and let Orfanidou stroke her belly. She had no one who cared for her in the world, but she still had so much love to give. "She was desperate for attention," Orfanidou said. Orfanidou watched the stray for a few days, as the dog tried to play on her own in the sand, or chased passing cars, or followed families visiting the sea. "I couldn't sleep for two days, trying to find a way to take her off that beach as soon as possible," she said. Finally, Orfanidou came and put her in the car. "I named her Blue for the blue sea that kept her company for the first few months of her life," Orfanidou said. Blue found a foster parent in Orfanidou, but she still needed a forever home. Meanwhile, up in Holland, a family was grieving the loss of one of their dogs, who passed away that summer. "Abbaio sadly passed away in the summer with leaving us and Rincewind [their other dog] mourning behind," Karin Folkerts told The Dodo. Abbaio and Rincewind worked as therapy dogs together, visiting nursing homes in the area through Stichting Snoezelhond and helping people with dementia and Alzheimer's feel happy again. Not only did the Folkerts family miss their dog - the people in the nursing home did too. But soon Folkerts would see a photo of Blue and fall in love. Thanks to Second Chance Animal Rescue Society (SCARS), Blue got all cleaned up and ready for adoption, so when Folkerts realized she had to take Blue home, Blue was ready to go. "We immediately pushed the contact button and before we know it we were called," Folkerts said. Orfanidou had a few conversations with Folkerts to see if Blue would be a match for the family, which includes Rincewind and also a couple of cats. A week later, with the help of Animal Association International (AAI), Blue was on her way to Holland. "A couple who was on vacation said they could take Blue with them [back to Holland] for us," Folkerts remembered. "On October 18, we picked her up at the airport." And the match was perfect from the beginning. "Rincewind, who was with us, immediately felt in love with her," Folkerts said. "That was so sweet and she was so welcome. Rincewind and she are BFFs." Blue got trained to be a therapy dog, and she just went on her first visit to the nursing home this month. People lit up when they saw her. "She doesn't have problems with people no matter what they are doing," Folkerts said. "She isn't scared when they are talking loud, are getting angry, are crying or noisy, she is so stable." "I realize it is just three months ago that Blue came to live with us," Folkerts said. "It feels like she was here for always." The stray who might have spent her whole life alone on the beach finally has a family and a real life, helping people feel happy. "Three months ago she was walking on the beach, offering her help, but nobody wanted it," Folkerts said. "Now she is received with arms wide open." To follow Blue's adventures as a therapy dog in Holland, click here. To help support SCARS, click here.